Plot: With the Clone Conspiracy over, Spider-Man is currently on the trail of his greatest enemy, Norman Osborn. However, Norman’s not the only familiar face re-entering Spidey’s life. 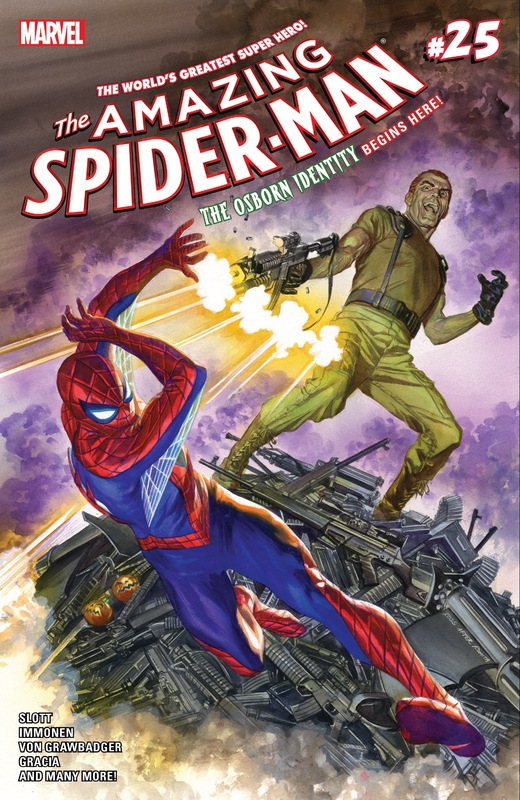 Story: Norman Osborn has been out of the spotlight since the final arc on Superior Spider-Man. I enjoyed the way Dan Slott kept Norman hidden from Spider-Man. Instead of wearing a Goblin mask, Norman got plastic surgery to completely change his appearance. Also he changes it whenever one identity gets compromised. Furthermore, Norman no longer has the goblin serum in his system which means he no longer suffers from insanity. However, there is one scene that suggests that he could snap again. 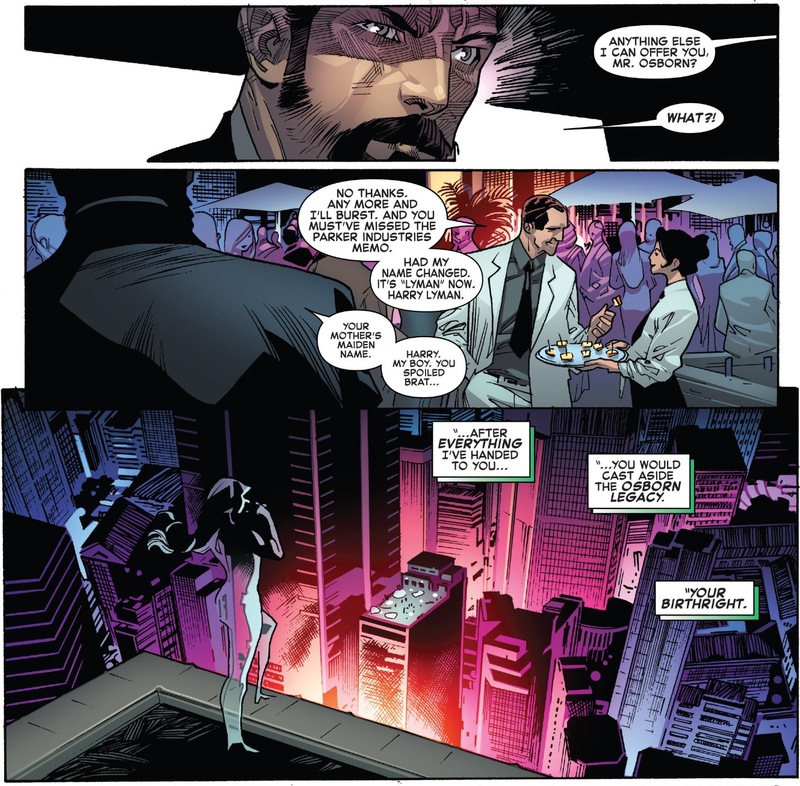 The scene involves Norman overhearing his son, Harry, stating that he no longer uses Osborn as his last name. 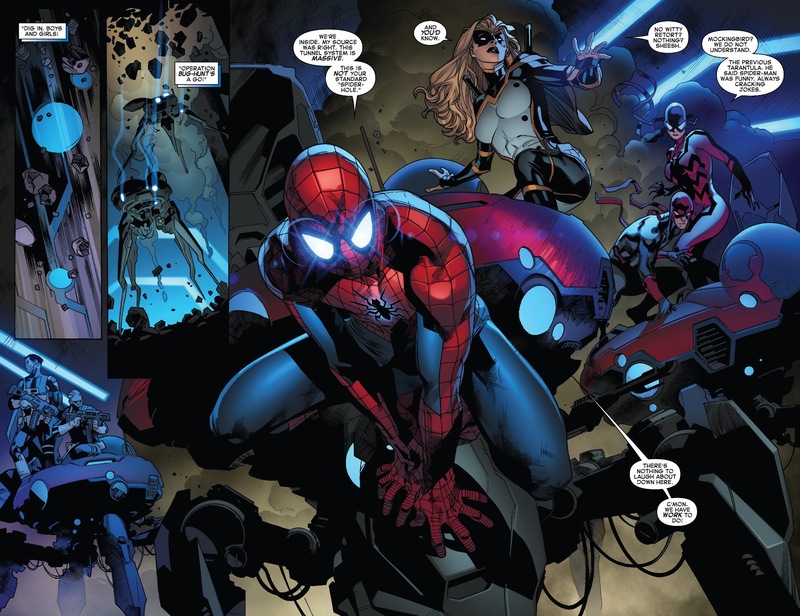 Other than Norman’s return, Slott also uses this issue to bring back (SPOILERS!) Silver Sable. At the conclusion of Ends of the Earth Silver Sable apparently drowned while fighting the Rhino. However, a few issues later Madame Web implied to Spider-Man that she may be alive. To be honest I forgot about Sable’s death until I read this issue. This reveal caught me off guard and heightened my excitement for this story arc. This issue also contains six back-up stories. Unfortunately only two stories tie into what’s going on in the main story. 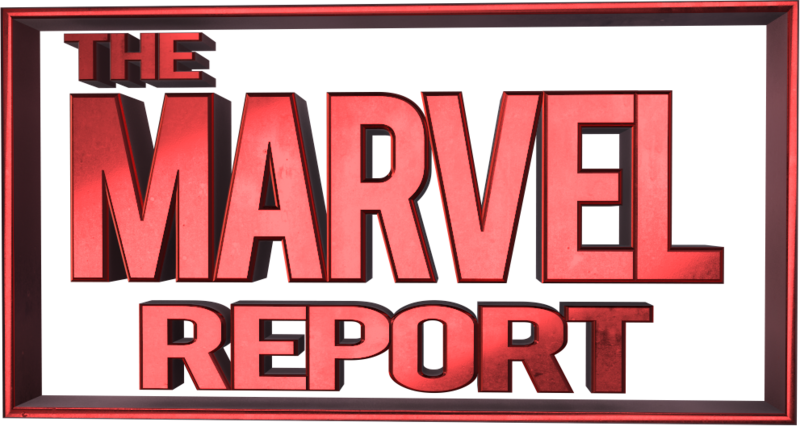 One story written by James Asmus involves Spider-Man choosing to save civilians instead of helping with a Parker Industries lab test. Spidey’s decision cost the company millions in damages and time delays. Before the story ends, P.I. scientist Phillip Chang warns Spidey that these losses could mean the end for Parker Industries. My theory is that Parker Industries could go under or Peter looses his CEO position. Either one of these outcomes would be an impressive end for Dan Slott’s run on Amazing Spider-Man. 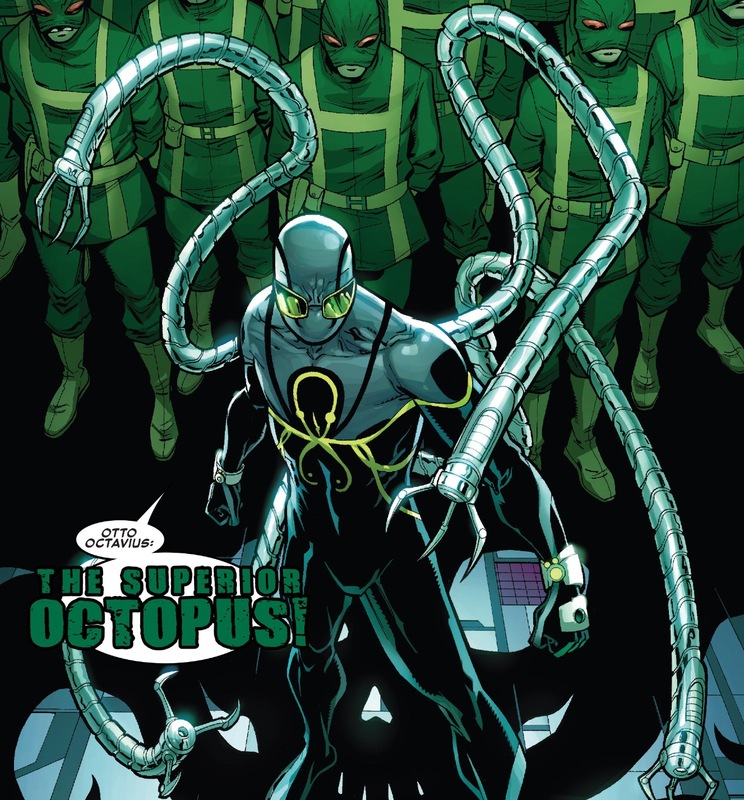 The other back-up that stood out featured Otto Octavius returning to an old base and joining Hydra. Octavius’s mind currently occupies the proto-clone from Clone Conspiracy which means he has spider-powers again. Also Oct’s Hydra alliance is just like Doc Oct’s role in the final season of Ultimate Spider-Man. Art: Stuart Immonen’s artwork is awesome. It’s really dynamic and the characters feel like they are leaping off the pages, especially during the action scenes. The artwork helps open the main story with a bang when Spider-Man and Mockingbird raid one of Norman’s compounds. Also Marie Garcia made excellent color choices. The colors of characters help them stand out in scenes taking place in dark areas or at night. The other thing I enjoyed artwork wise was Doc Oct’s new costume as the Superior Octopus. I like how the suit resembles his Superior Spider-Man costume with Doc Oct tentacles. Plus the suit’s darker colors are a great contrast to the bright green and yellow used in Oct’s previous appearances. In a way it shows how far Otto has evolved as a character. Verdict: Dan Slott did an amazing job bringing back Norman Osborn and setting up Doctor Octopus for Secret Empire. However, I do not think people should pay $10 for a single issue. A casual reader would be better off borrowing this issue from a friend who already owns it.